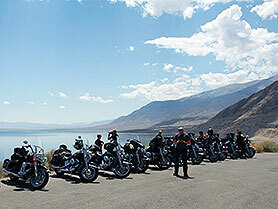 "California Dreaming" - our 12 day Semi Guided motorcycle tour through California and Nevada will take you to the most beautiful places of the American West. 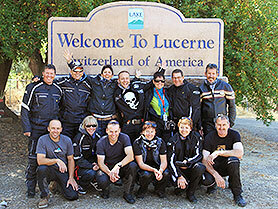 With the motorcycle you will ride along the famous Highway 1 from Los Angeles to San Francisco and discover the beautiful region of Big Sur. 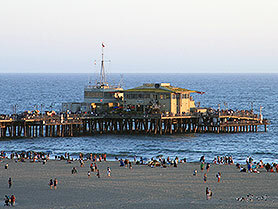 After a visit to San Francisco and the exciting ride on the Golden Gate Bridge you will discover the wine-growing areas in northern California and the artists town Mendocino before your motorcycle tour leaves California and heads south through the Nevada Desert. 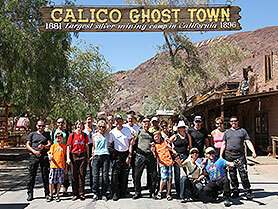 In Nevada, visit the gambling mecca of Las Vegas and discover the old "Wild West" in the ghost town of Calico with their closed down silver mine. 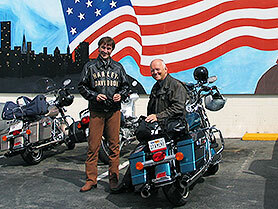 Your Semi Guided motorcycle tour through California and Nevada ends in Los Angeles. Day 4 is a rest day in San Francisco. 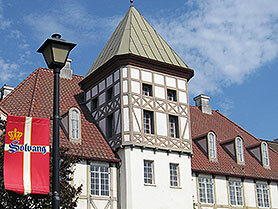 You may wish to explore the city on foot or using some of the city's famous cable cars. 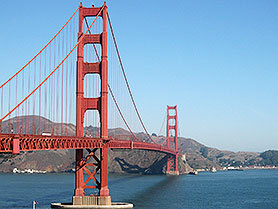 Highlights include the Golden Gate Bridge, one of the world's longest suspension bridges, the Haight-Ashbury district, Chinatown, Fisherman's Wharf, Nob Hill, Union Street, and Lombard Street. 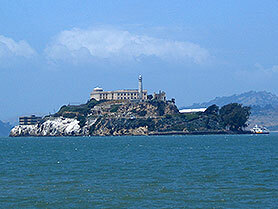 You may also wish to visit Alcatraz, famous as an official US Army prison and then as a Federal prison. You start the day by riding over the Golden Gate Bridge and a photo stop, heading into Marin County and the artist town of Sausalito. You journey now takes you through stunning scenery as we pass Mount Tamalpais and miles of redwood groves. On a good day the snow-covered Sierra Nevada range can be seen. You hit the Pacific and the Wild Coast, passing through Muir Beach, a small hamlet where ocean-view homes oppose the bluffs of the Golden Gate National Recreation Area. 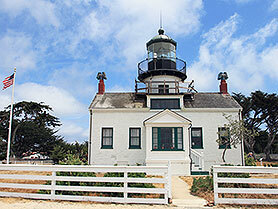 Continuing north, you pass through Fort Ross and Gualala, stopping in Mendocino, a renowned haven for artists, writers, woodworkers, potters, etc. You will be able to buy gifts and souvenirs here if you wish. A highlight of the day is Leggett, with its "Leggett Drive Through Tree". You spend the night in Laytonville. Day 6 continues your journey along Clear Lake, the largest natural lake in California, and the outskirts of the Mendocino National Forest. You travel through the forested hills, turning south. Passing Sacramento you travel to Placerville, a gold rush town, and then on to Camino in the heart of the El Dorado Wine Country. 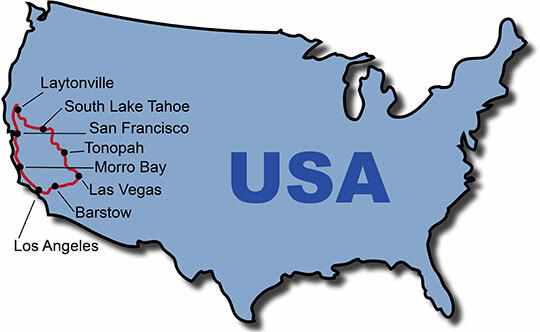 You route now takes you through the Eldorado National Forest and into South Lake Tahoe and Stateline, where the California- Nevada State Line can be found. 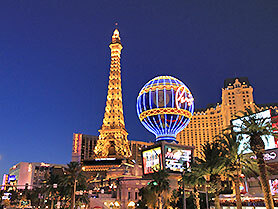 If you feel like trying your luck, Stateline has many world-class casinos. Your day begins with a journey through the Toiyabe National Forest toward Genoa, the oldest permanent settlement in Nevada and one of the most attractive villages in the American West. From Genoa, you continue north to Carson City and Virginia City. 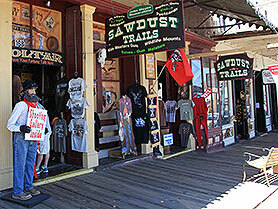 Virginia City, which was once a boom town, now stands as a monument to the riches that could be obtained during the gold rush. Day 8 starts as you head east and then south to Yerington, situated along the banks of the Walker River and surrounded by picturesque mountains full of ghost towns and old gold mining camps. You continue to Hawthorne, with the landscape slowly changing into a desert environment, before reaching Tonopah, an old mining boom town. 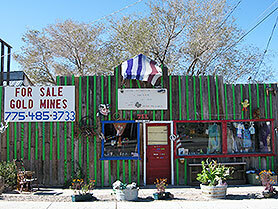 You will be able to get a real feel for Nevada's colourful history here.